NATHAN ENGLANDER is the author of the novel The Ministry of Special Cases, and the story collections For the Relief of Unbearable Urges and What We Talk About When We Talk About Anne Frank, winner of the Frank O'Connor International Short Story Award and finalist for the Pulitzer Prize. His short fiction has been widely anthologized, most recently in 100 Years of the Best American Short Stories. Englander's play The Twenty-Seventh Man premiered at The Public Theater in 2012. He also translated the New American Haggadah and co-translated Etgar Keret's Suddenly a Knock on the Door. He is Distinguished Writer-in-Residence at New York University, and lives in Brooklyn, New York, with his wife and daughter. "Nathan Englander's latest is, as usual, superb: a work of psychological precision and moral force, with an immediacy that captures both timeless human truth as well as the perplexities of the present day." 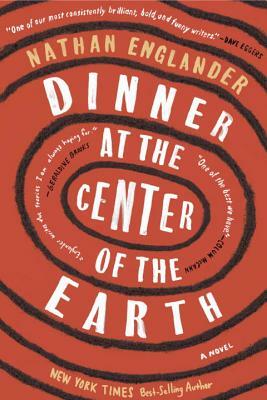 "A kaleidoscopic fairy tale of Israeli-Palestinian reconciliation... One of the exhilarating aspects of Dinner at the Center of the Earth is its expansive sense of space and time...The effect is to heighten events, to transcend history in favor of a more allegorical realm...Englander has built a complex structure, by which his narrative reveals itself in pieces, and the less we know in advance, the more vividly we feel its turns...with this novel he frames history as both an act and a failure of the imagination, which is to say, in inherently, and inescapably, human terms." "Englander has produced a masterpiece of literary imagination that seems to mirror his own evolution." "The ability to see the world from both Israeli and Palestinian perspectives is what gives Dinner at the Center of the Earth its optimistic moral center. Both Israelis and Palestinians are faithful to the righteousness of their own cause, but at times, characters can see a way past this most charged of conflicts to a future of peace... Yet while the novel is optimistic, it is also realistic. The violence, and the historical memory of past violence, keeps both sides addicted to carrying out further attacks in the name of retribution. Englander’s ability to capture the almost pathological nature to ‘get even’ shines." "Appealing... Clever, fragmented, pithy... Englander is a wise observer with an empathetic heart." "Since Englander set out to write a thriller, he delivers all of the twists and turns, the shocks and surprises, that we are entitled to expect in that genre. But he does not disappoint the readers of his earlier work who know him for his exquisite sensibilities and the sheer power of his literary prose. For that reason, Dinner at the Center of the Earth will only expand his reach and enrich his already considerable reputation." “Nathan Englander's fiction [is] always animated by a deep, vibrant core of historical resonance."